Offered nigh two thousand years ago. Thus, I first learned of Atonement. That One had come whose power would save. Of the wondrous gift of Atonement. I was taught that through Christ death’s bands had been broken. With the knowledge of the Atonement. I took down the scriptures from my bedroom bookshelf. Thus, read on my own what had been taught to me. Yes, read for myself of Atonement. If these scriptures were true: for if true, they were love. Of the scriptures that spoke of Atonement. Continued to say they believed it was true. Was in the truth of the Atonement. Travelling and living alone I planned. The comfort of the Atonement. I oft missed the point of redemption’s great cost. 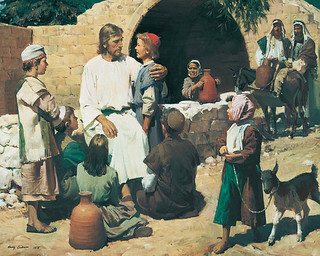 The blessings of His Atonement. Though a sinner, I could be clean once again. And believe in the Atonement. Together we sought to take His name. For we all must pass the refiner’s fires. I see His past help, through mortality’s thorns. Life’s hardships continue, but I can say that I know. But the power to endure also comes through His name. Through the strength of the Atonement. Of this I am certain – He has borne them too. The love in the Atonement. I now teach my children that they too may know. The power of Christ’s Atonement. Categories: Poems | Tags: Atonement, Children, Christ, Christian, Faith, LDS, Mormon, Poetry, Religion | Permalink.